I made this cake with one box of cake mix. I baked two 8X8 square cakes using 8x8 square pans. After the cake baked and cooled, I covered it with buttercream frosting, then white fondant. 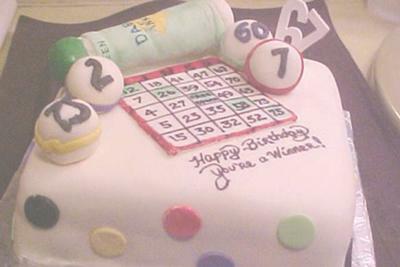 A week before, I made the bingo card and balls out of fondant to harden. I also did a few colored circles out of fondant for color. Too cute! I love this idea!!!!!!!!!!! This is an awesome looking cake. This is a very original cake idea. Also, great attention to detail. I like how you placed everything on the cake as well. Very nicely done! Thanks for sharing.